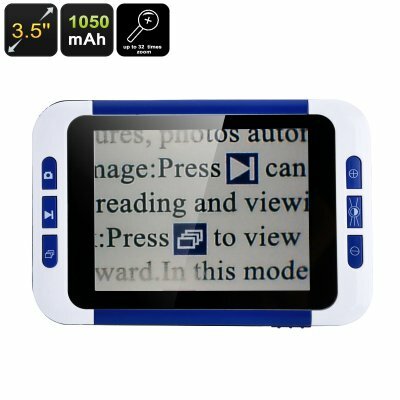 Successfully Added 3.5-Inch Portable Digital Magnifier - LCD Display, 2x To 32x Magnification, Three Color Modes, 32GB SD Card Slot, 1050mAh to your Shopping Cart. Read books and newspapers without wearing your glasses thanks to this handheld digital magnifier. This electronic reading aid features a 2x to 32x magnification. Thanks to this, you’ll be able to read the smallest text without needing your glasses. On its 3.5-Inch LCD display, all text will be clearly portrayed. The video magnifier is light in weight and features a pocket size. This allows you to carry it along anywhere you go. It even comes with an intergraded LED light. With this light source, you’ll even be able to read at night. A powerful 1050mAh battery provides up to 4 hours of continuous usage time. With this power, you’ll get through the day without needing to worry about battery life. Whenever you’re running low on juice, the battery can be easily recharged. This digital magnifier comes with wrist cord that makes it safe to use for the elderly. Thanks to this little accessory, you won’t have to worry about accidentally dropping your electronic gadget. In case the video magnifier does fall, there is still no need to worry about its well-being. With its durable design, this electronic reading aid has been designed to withstand a hit. Perfect for checking the small print on medication bottles, plus you can take a snapshot of whast you are looking at for later reference.